A 2-year-old boy was fatally struck by an AC Transit bus in East Oakland on Tuesday afternoon, authorities said. The child was chasing a ball into the street when the collision occurred, according to the Oakland Fire Department. The accident occurred about 2:15 p.m. in the 2900 block of 35th Avenue. 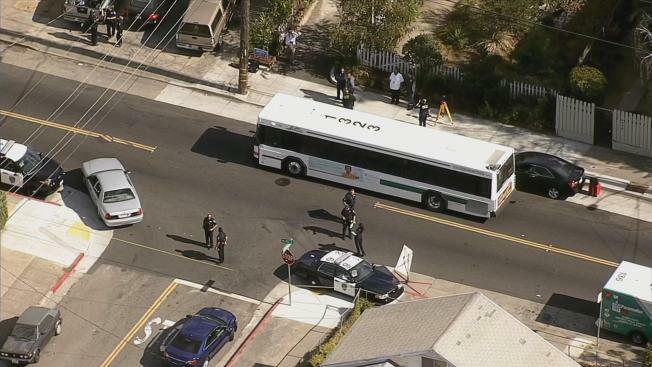 "When officers arrived on scene, they found that a 2-year-old boy was fatally struck by a bus traveling northbound on 35th Avenue," Oakland police spokesman Officer Marco Marquez said. Witnesses descibed a horrific scene. "We see the mother of the child pick the kid up and holding him in her arms," said Yasmine Poitillo. "There was a lot of blood." Poitillo said passengers on the bus were in tears and the bus driver was so distraught he appeared to be having a panic attack. He was cooperating with investigators, police said. The boy, who was identified only as Jeremiah, was playing with a ball, and when it went into the street, he went after it, his aunt said. AC Transit said its normal protocol is to do alcohol and drug screening of the operator involved. The agency released a statement in response to the accident. "AC Transit wishes to extend our deepest condolences to the family of the child involved in today’s tragic event. We will continue to work closely with the Oakland Police Department as they investigate the circumstances of this event," the statement said. The driver has been with AC Transit since 1999, the agency said.